When you're typing "Jessica Biel screensavers" into that Google searchbox, you might just wind up with more than you're ready to bargain for. 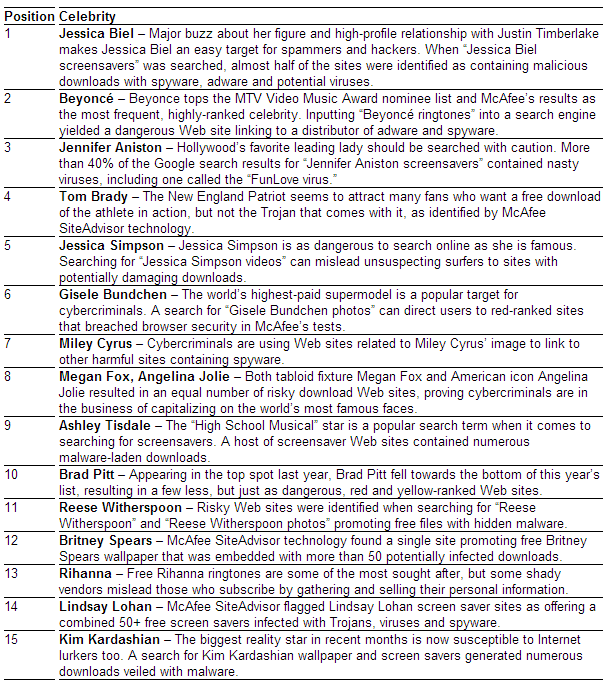 According to McAfee's third annual report listing Hollywood's most "dangerous" online celebrities, they have named Jessica Biel the most hazardous celebrity on the Internet, followed by Beyonce, Jennifer Aniston, Tom Brady and Jessica Simpson, completing the top 5 list. Apparently cybercriminals know their Hollywood stuff and "latch onto popular celebrities to encourage the download of malicious software in disguise", Jeff Green, senior vice president of McAfee Avert Labs, said in a statement. "Consumers' obsession with celebrity news and culture is harmless in theory, but one bad download can cause a lot of damage to a computer."